The Contractors State License Board (CSLB) protects consumers by licensing and regulating California's construction industry. There are about 300,000 licensed contractors in the state, in 43 different licensing classifications. 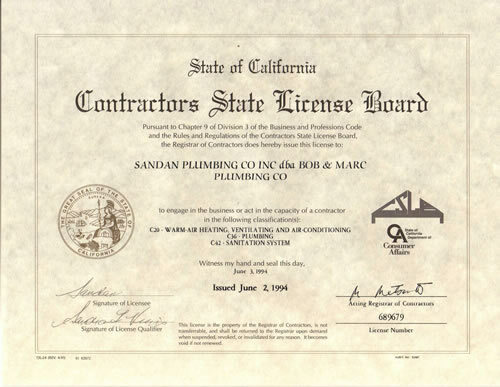 In addition to educating consumers about contractors and construction law, CSLB activities include administering examinations to test prospective licensees, issuing licenses, investigating complaints against licensed and unlicensed contractors, issuing citations, suspending or revoking licenses, and seeking administrative, criminal, and civil sanctions against violators. In fiscal year 2010-11, CSLB helped recover nearly $45 million in ordered restitution for consumers. The CSLB's Statewide Investigative Fraud Team (SWIFT) works to eliminate unlicensed contractors working in California. Undercover sting and sweep operations are conducted weekly around the state. SWIFT encourages you to report unlicensed activity. The http://www.cslb.ca.gov/ web site you can find educational materials about hiring contractors and the construction process. You can also check the status of a contractor's license, find other important Contractors License Law information and file a complaint.